Mix of feminized outdoors seeds. 3 different old school Dutch favorites in pack, ready to be grown in your own garden. Dutch Passion - Colour Mix 2. 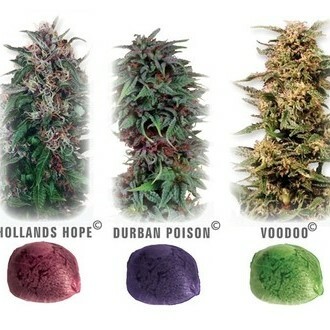 Colour Mix 2 by Dutch Passion is another great mix pack of feminized seeds for outdoors. This time it is 3 different old school Dutch favorites. 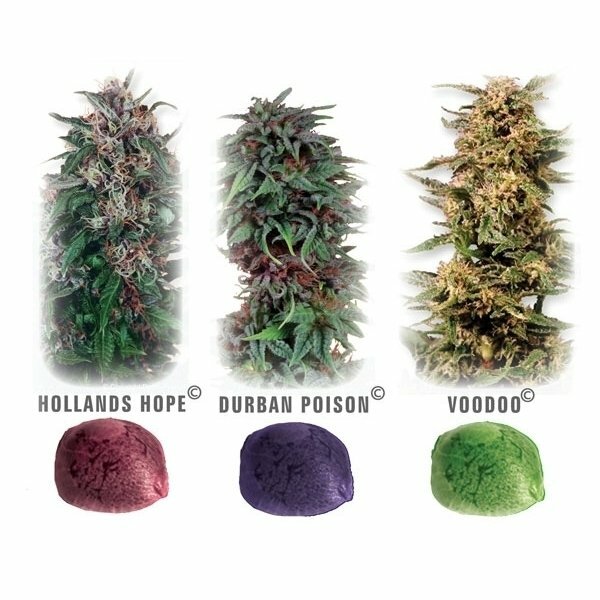 Hollands Hope: A strain that has been grown outdoors in Holland for many years and is legendary for her mold resistance and her huge nugs. She smokes with a heavy stone and is a perfect medicinal marijuana. Durban Poison: A Sativa strain that came to Holland from South Africa a long time ago and has been perfectionized for outdoor-growing. She is the perfect Sativa and creates beautiful tall nugs that will reward the grower with a long-lasting upper-high. Frisian Dew: Designed as an outdoor variety, Dutch Passion's Frisian Dew is a guarantee of generous crops and a lasting smile on the smoker's face. 50/50 Indica-Sativa, a real beauty to look at, with dense, light purple buds.